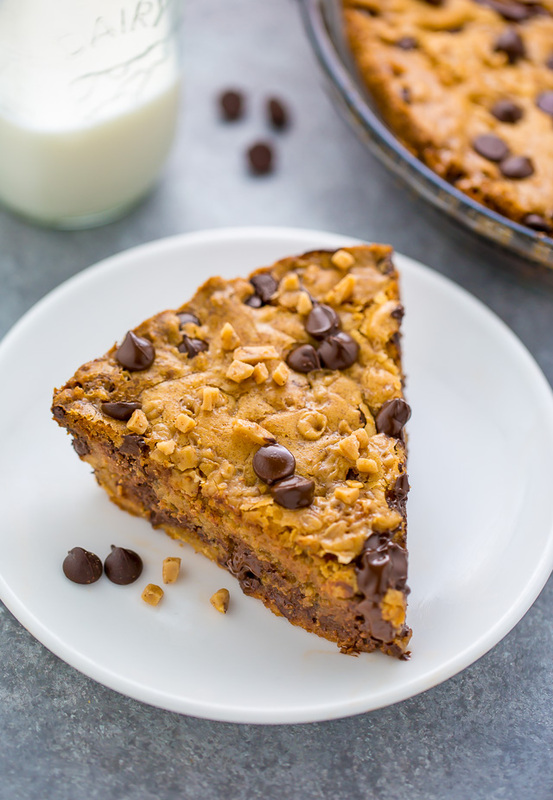 This Toffee Chocolate Chip Cookie Pie is thick, chewy, and just begging to be served with a scoop of ice cream! My best friend’s birthday was yesterday and oh man did we celebrate! We started the day off with coffee and eclairs, enjoyed a mid-day champagne brunch, paused for present opening, spent the evening sharing a pizza and TWO amazing pasta dishes (must recreate those for you soon) and finished the day off with a slice of pie. 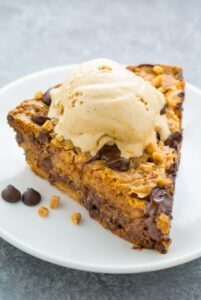 And by pie, of course I’m talking about this toffee chocolate chip cookie pie! It was the perfect ending to an utterly decadent day. 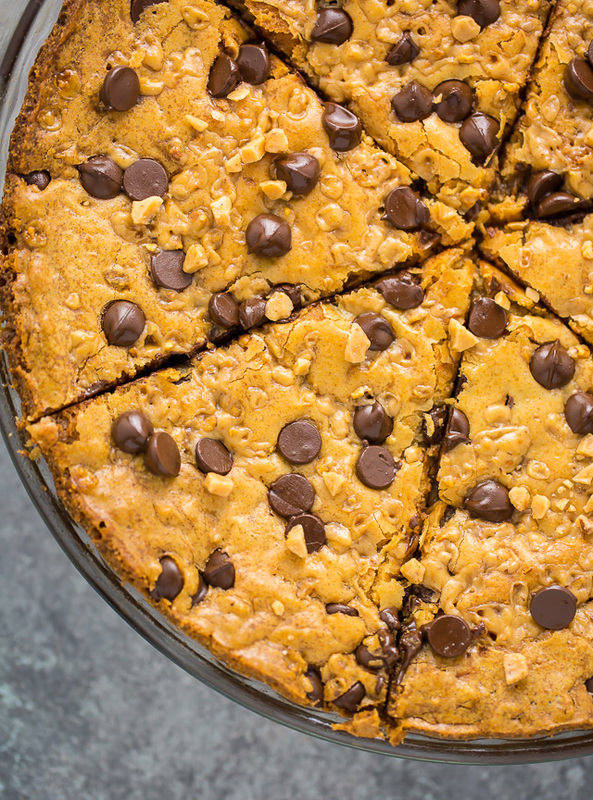 If you’ve never had a cookie pie before, you’re in for a real treat! It’s basically a giant cookie pretending to be pie, and it’s absolutely delicious. My version is extra chewy and loaded with chocolate and toffee. It’s also a million times easier than a traditional pie. 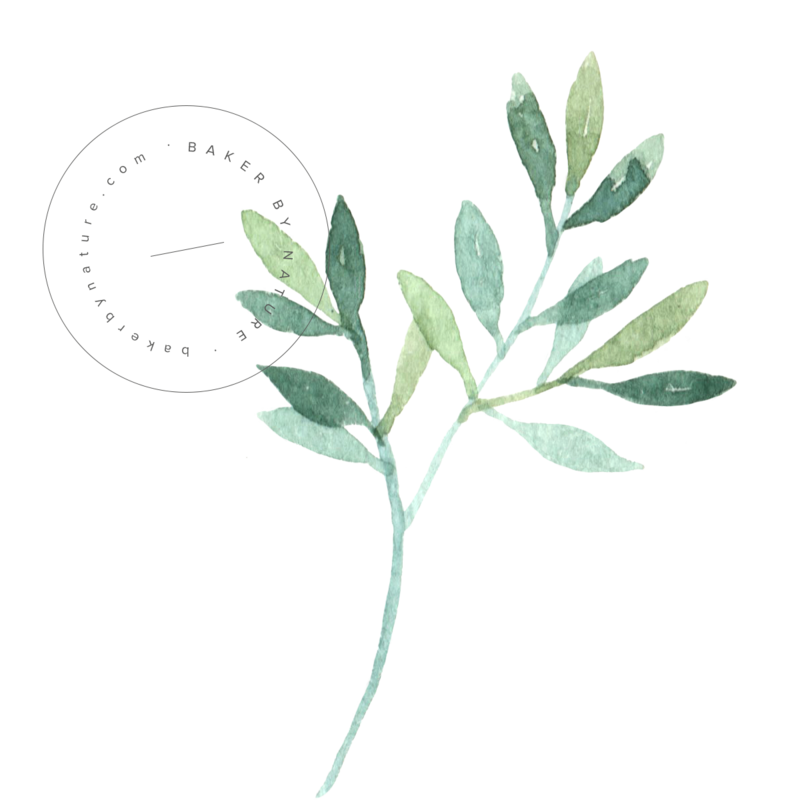 ↑ What’s not to love?! Toffee bits should be easily available in the baking aisle at most supermarkets. 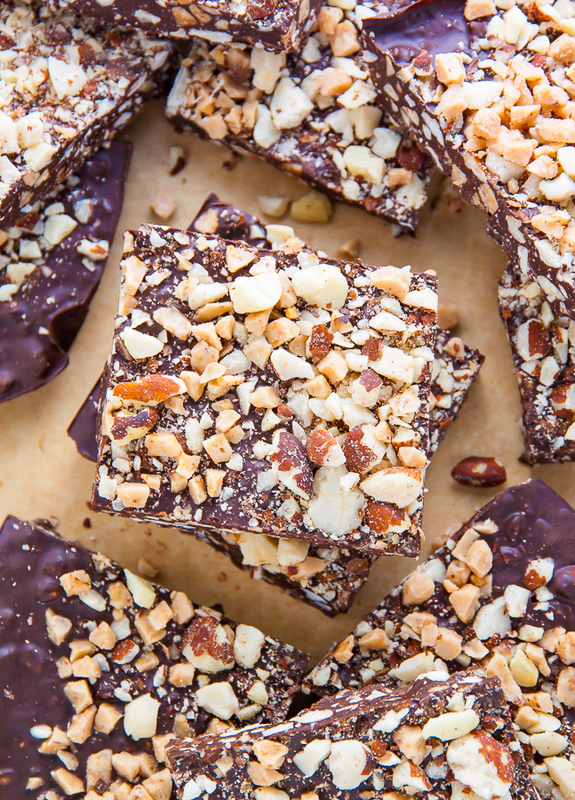 For this recipe, you’ll want the plain toffee bits, not the chocolate toffee bits. You can also click here to order toffee bits online. 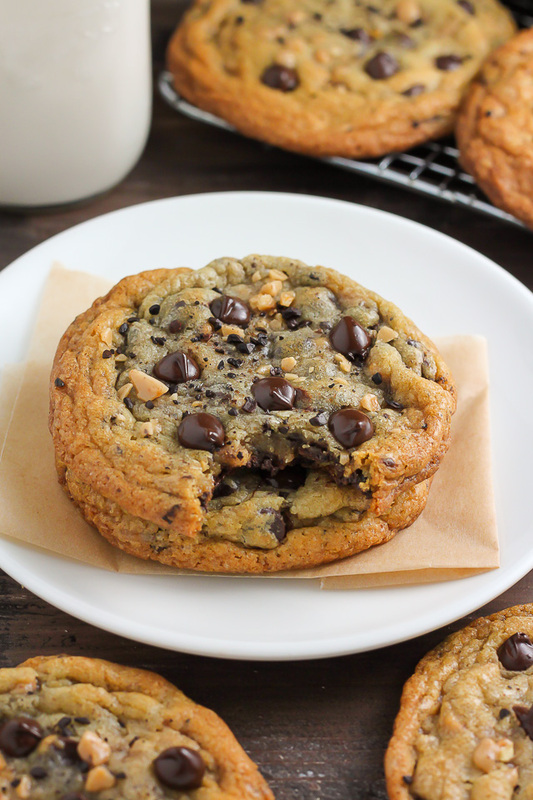 Don’t over bake your toffee chocolate chip cookie pie! Although I’ve given an estimated bake time in the recipe box below, every oven is a little different, so be sure to pay attention to visual clues. When your pie has a shiny, golden top, set edges, and just a little jiggle in the middle, it’s ready to come out of the oven. Over baking will result in a dry, crumbly cookie pie. 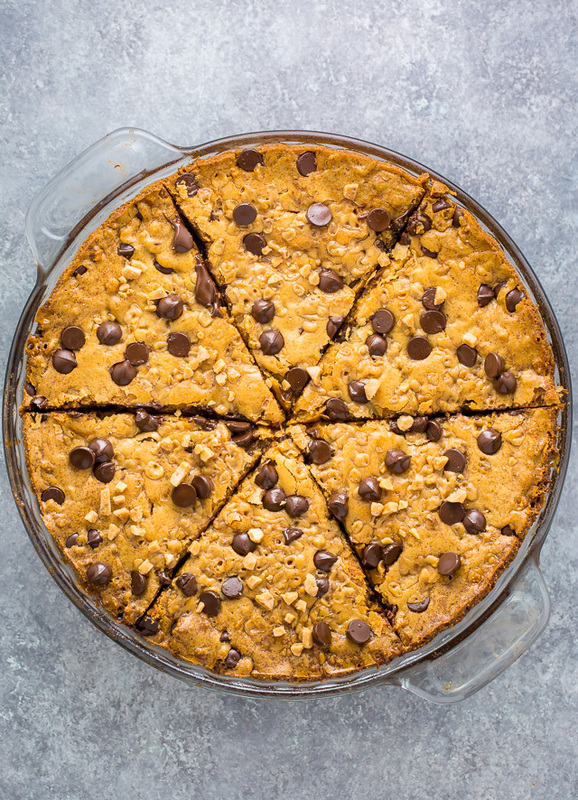 If you’d like your toffee chocolate chip cookie pie to look exactly like the one you see in my photos, sprinkle a handful of toffee and chocolate chips onto the warm pie right when it comes out of the oven. 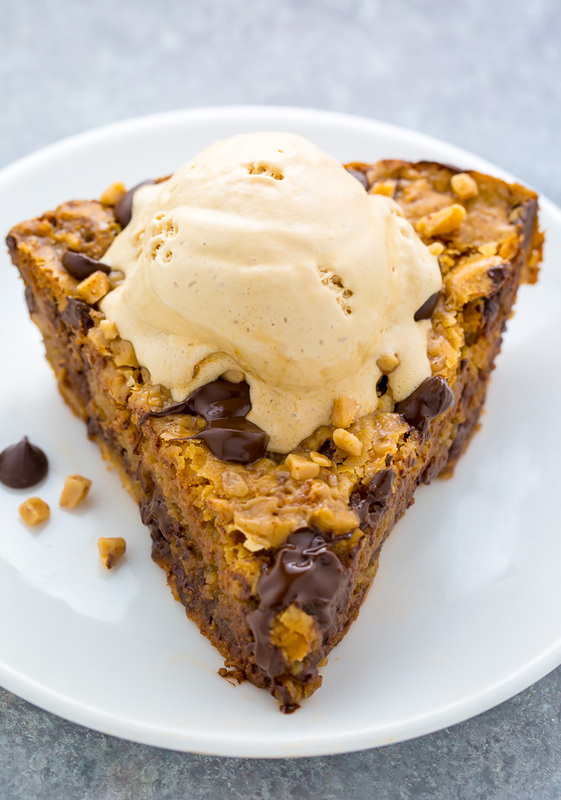 For an extra decadent dessert, serve this pie with a scoop of ice cream! I topped my slice with salted caramel gelato and it was EPIC. This Toffee Chocolate Chip Cookie Pie is thick, chewy, and perfect with a scoop of ice cream. In a large bowl add the melted butter, brown sugar, and granulated sugar; beat well until combined. Beat in the egg, egg yolks, and vanilla. Add in the flour, cornstarch, and salt and mix until just combined. Be sure not to over mix here! 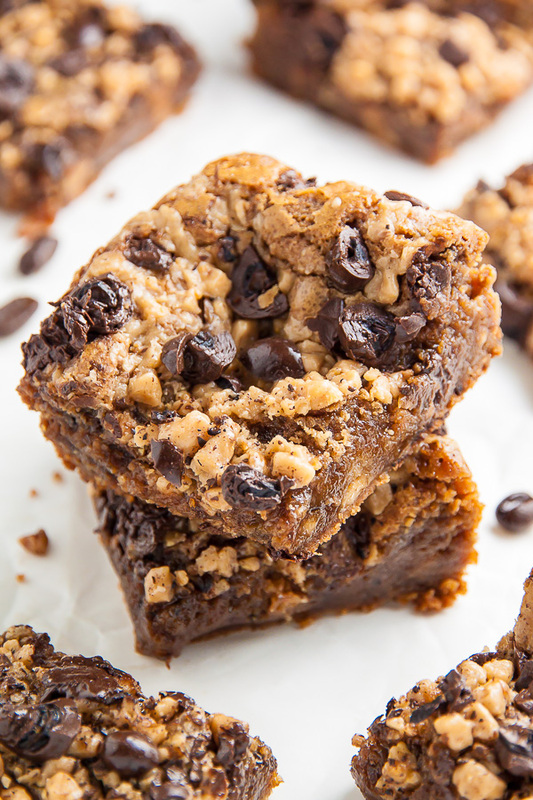 Fold in the chocolate chips and toffee bits. Spread the mixture into the prepared pie plate and bake for 35 to 40 minutes, or until the top is golden brown, the edges are completely set, and the center of the pie is only slightly jiggly. Place pie on a wire rack to cool for at least one hour before slicing and serving. 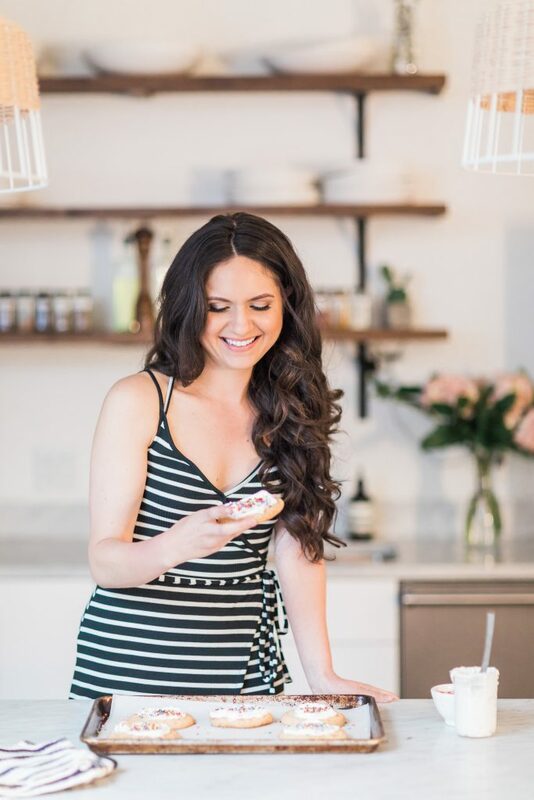 I love how you don’t have to choose between a pie and cookies for dessert, you can have both at once! Yum! Yummmmmmm, only thing I would change would be to cut that cookie pie in 4 slices instead of 6 so I get a bigger piece! as i don’t eat eggs, could you please advise me how to replace it in this beautiful recipe to get the same result? Hi Ashley, I don’t eat eggs either. Any suggestions on what could work with this recipe as substitutes for the egg? Hey can i make a day in advance? And keep in refrigerator or freezer?